Prototyping: 3D Printing or CNC Machining? Advances in 3D printing capabilities have spawn a new generation of questions concerning the prototypes to production manufacturing processes. JW Machine is an industry leader in CNC machining using state-of-the-art machining centers and CAD design experts. 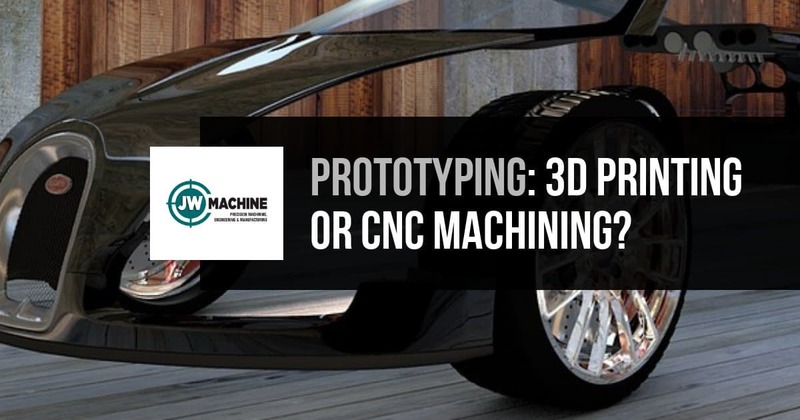 Let’s take a closer look at both the 3D printing and CNC machining processes to determine which method would be best for your next small part machining or prototypes to production manufacturing project. 3D printing and CNC machining both utilize ultramodern CAD design software, but the similarities end there. 3D printing uses a process of material addition to produce the object, where CNC machining uses material subtraction. CNC machining centers use high speed rotating milling turning cutting tools to remove material. In the 3D printing process, the printer uses a material extruded through a nozzle, continuously adding material in subsequent layers to build the object. 3D printing processes are very limited in the types of materials which can be used. Material limitations also affect the components strength. CNC machining centers can accommodate virtually any solid material, even ice! 3D printing has extreme limitations on surface finish. CNC machining centers provide any desired surface finish for the type of material used. The additive process of 3D printing is extremely slow and high rate of energy consumption. If you have a small part machining or prototypes to production manufacturing project, let JW Machine’s expert CAD design engineers evaluate the best process for your job. Our professional staff and state-of-the-art CAD design software, CNC machining centers and milling turning equipment can tackle your project no matter the material, size or complexity. Give JW Machine a call today!